Michael just isn’t cracked up to be George. 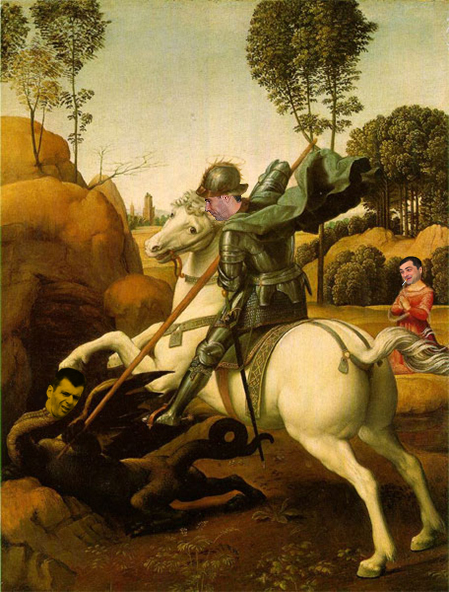 The warrior qualities of Russia’s patron saint could come in handy in politics – aim, endurance, fearlessness – but Mikhail Prokhorov has managed in his three-month political career to demonstrate their opposites, and to prove – stunningly if you calculate his personal wealth — that he’s innumerate: his capacity to count – votes, not money – is pathologically unformed. Votes are like money in one respect, which all politicians, in Russia or elsewhere, must either understand, or go broke. They are promissory notes – tenders of support on condition the candidate who receives the votes understands that he is obligated to deliver on his promises with the power the votes ought to provide. In business, Prokhorov was already, according to those who have worked for him, famously short on attention span, long on self-absorption, and indifferent to minorities. Could he tell the difference between a buyer of shares in one of his companies – Norilsk Nickel until 2007; Rusal since 2010; Polyus Gold; and Quadra (TGK-4) – and voters in an election campaign? In fact, Medvedev had made a public showing that he didn’t back Prokhorov for the Right Cause post, and encouraged Finance Minister Alexei Kudrin to take the spot instead. That was on June 20, weeks after Prokhorov claims now he had gotten the nod. Back in May, it had also seemed that Prokhorov was the choice of the election advisors to Prime Minister Vladimir Putin, who didn’t need Prokhorov or Right Cause, so much as it seemed a good idea to ensure that Medvedev’s candidacy for a second term as president didn’t find a party platform and a national run for votes. If that was Putin’s stratagem from the start, Prokhorov has proved to be the ideal stooge. In three months, the polls were showing that Prokhorov was good for an increment of just 1% on the Right Cause’s bedrock of between 1% and 2% of the electorate. Then Prokhorov intimated that his ideas were too radical, not to say democratic for “the Kremlin”. The ideas included rewriting the Constitution to give the State Duma powers to impeach government ministers; limiting the governing or majority party to 226 seats; and reinstating direct elections for regional governors. These were Prokhorov’s fighting words on September 15. Two days later, he announced: “there was no personal conflict with anyone. … In the end it was a conflict of ideologies,” Prokhorov wrote in one of his blogs. “At this stage the conservatives won. I wanted change, but the system was not ready.” The prime minister’s and president’s schedules have yet to open and admit him. The volume of cash Prokhorov pumped into Right Cause has been variously reported (up to Rb800 million, $27 million). But Prokhorov is categorical on the point – since the cash hasn’t bought acquiescence, he is demanding a refund. Prokhorov has a history of representing sentence-long slogans as public programmes or ideologies – paying for them as if they were prospectuses for outfits whose shares he controls like Polyus Gold. There is no evidence of votes sought or public endorsements issued for these “ideas”. In the only election contest Prokhorov had fought until this year – the Polyus Gold annual general meeting of shareholders in June 2008 — Prokhorov heaped vitriol on the one independent director who dared to challenge him – Lord Patrick Gillford. Prokhorov also lost the voting on that one. There is a pattern of his attacking the Russian leadership, and then retracting within 48 hours. In his relations with the French government, Prokhorov has demonstrated that he has been unable to procure either apology or acquittal and vindication on the charges that led to his brief imprisonment in January of 2007. If Prokhorov hadn’t made a public fetish of keeping time more accurately, also expensively than almost anyone else in Russia – wearing a Pierre Kunz Red Gold tourbillon – this calculation might be credible. Now that he’s down for the count, though, Prokhorov is the first oligarch to prove he has trouble counting whatever doesn’t belong to him.